Houses and heavy items are individually priced. 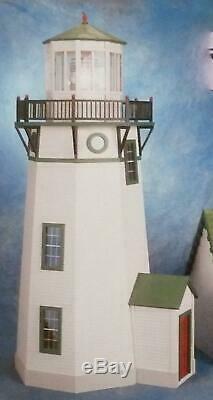 Dolls House Lighthouse Kit Miniature 1:12 Scale Wooden Flat Pack Unpainted. The New England Lighthouse dolls house kit features a realistic blinking beacon. This dolls house kit when assembled is simply stunning at almost 1.2 Metres = 4 feet tall. 1:12 Scale Classic Features Include: Precision Workmanship - engineered parts pre-cut to really work Sturdy Construction features 3/8 inch thick milled clapboard exterior walls and grooved sidewalls for easy, one-step assembly, guaranteed fit and durability 3/8 inch thick upper floors Rail assembly required Assembled Front door with interior trim Window kits include interior trim Blinking bulb included - Wired ready to use, including 25 watt candelabra bulb. Please Note Power supply is 110 volt can easily be altered to accept mains 240 volt or Dolls House 12 volt Glass Prism light fixture Brackets and ladder assembly required Unique wraparound stairs and ladder for decorating and play Step-by-step instructions with detailed drawings. SKU: RGLH0100 / Barcode: 0767192601100. Our products are not playthings and are not meant for children under the age of 14 years. These items are intended for adults to use in the construction and accessorising of dolls houses and similar projects. Use by children under the recommended minimum age could present choking and other hazards. We've got you covered! The item "Dolls House Lighthouse Kit Miniature 112 Scale Wooden Flat Pack Unpainted" is in sale since Tuesday, March 12, 2019.